Even if you are not a follower or practitioner of Hinduism, Ganesha, with his elephant head atop a human body, is an Indian deity that is easily recognizable. He is “the Remover of Obstacles, Patron of Arts and Sciences, and the God of Intellect and Wisdom”–one of the best-known and most widely worshiped in the Hindu pantheon. Believed to grant prosperity and success, Ganesha can be seen in many areas of life, especially the beginning of ventures. With this in mind, try out Yukti Group’s Daily Blessings app for a great start to your day. Each day brings a new quote about life, spirituality, love, friendship–anything that brings meaning to our lives. 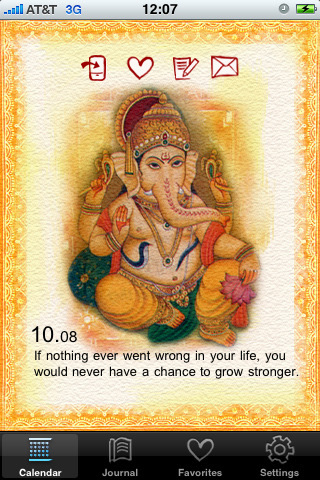 This app is similar to a Christian daily motivational, except these blessings are accompanied by a new piece of art everyday, featuring Ganesha. Above the artwork are four icons you can use to be both introspective and social. The first saves the artwork into your Photo Album, the second adds the blessing (artwork and all) into a Favorites list, the third allows you to attach your own thoughts to a blessing, and the fourth shares the blessing with the rest of the world through your Twitter, Facebook, or email. Tapping on the Journal tab at the bottom will give you access to all the notes you’ve written. We live such fast-paced lives, it’s easy to get caught up in them and avoid reflection. Daily Blessing strives to gently steer us off the highway of our lives and take a small detour; accessing it is a fantastic way to step back and take a deep mental cleansing breath. Those worried about the app being overtly religious or not being religious enough themselves can relax: anybody can find these simple messages inspirational. I do wish that the Favorites list wouldn’t send the user over to the daily calendar whenever a Favorite blessing is tapped on (I just want to scroll through the Favorites by themselves, thank you), but that’s about the only thing I didn’t enjoy about this app. Otherwise, the absolutely gorgeous artwork and applicable messages make Daily Blessings a joy to go through. 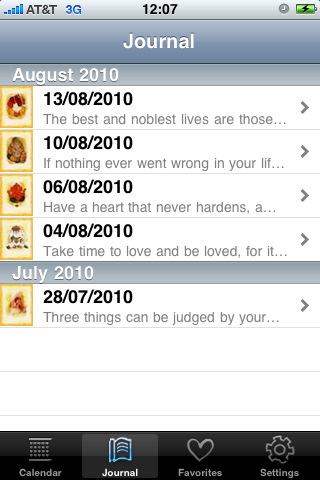 AppSafari review of Daily Blessings was written by Julie Guan on November 18th, 2010 and categorized under App Store, Asia, Religion. Page viewed 4598 times, 1 so far today. Need help on using these apps? Please read the Help Page.